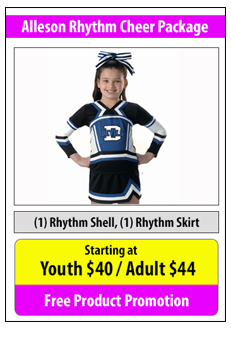 Pro Player Supply offers a wide selection of Cheerleading Uniforms, Apparel, Pom Poms, Bags and More. Popular brands include Alleson, Augusta, GK Elite and more. 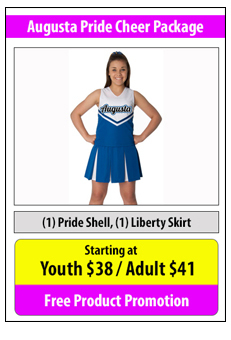 If you don not see a package that interests you below, For questions or to order contact a cheerleading specialist today at sales@proplayersupply.com or call us at 800.657.7630. 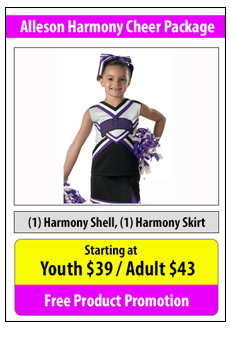 Pro Player Supply offers stock and custom uniform packages, team spirit wear and equipment cheerleading programs. We offer custom artwork design as well as stock designs for quicker turnarounds. 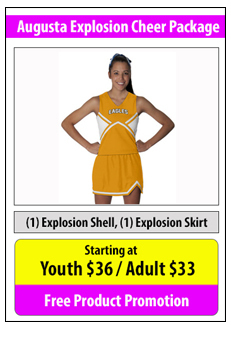 Choose from various uniform styles including sublimation, stock and custom uniforms. Need Team Shoes? Shop various styles from Asics America at unbeatable pricing. Asics offers cheer and dance shoes designed for ultimate comfort and performance. View our cheer shoes here.